If you are looking for full-fledged squirrel proof bird feeder solution with pole and anti-squirrel baffle or weather guard included, these two feeders are definitely worth of your attention. As you will probably notice first, what we've got here are highly decorative bird feeders that add up to aesthetics of any garden or backyard. But how squirrel-proof they are? Well, if it's to judge by dozens of customers who bought, reviewed and rated Brome Squirrel Buster Plus and Zenith Innovation 001 Effortless Bird Feeder with Baffle, these two feeders share high third position on the top ten list of best rated squirrel proof feeders available on the market today! Now let's see why these feeders get so many positive feedback from its first time or returning customers and why so many people decide to buy even more than one piece of these feeders? This feeder does not come with accessory seed trays or anti squirrel baffle, but luckily - the pole is standard in diameter (1 1/4 inch) so almost any baffle will do the trick. If you need advice for a really good baffle, you can find more info in my article on anti-squirrel baffles for bird feeders. Also, if you are interested in seed tray, I'd strongly recommend Brome seed tray because it is compatible with Brome pole from the feeder. "Zenith Innovation 001 Effortless Bird Feeder with Baffle"
"Zenith Innovation" in the essence is a pole mounted bird feeder. 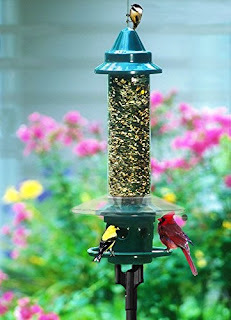 It consists of tubular bird feeder and feeder pole. Tubular feeder can store up to 13 cups of bird food and it is made of UV resistant poly-carbonate plastics. This means the plastic tube does not get blurred in the sunlight after some time. Also, the feeder's tube is constructed to slide up and down the pole - that comes pretty when refilling bird food reservoir! The feeder pole has following additions: pole roof, bird feeding tray, anti-squirrel baffle and pretty solid free standing base. The secret of feeder's squirrelproofness (is there such word?) is in both it's construction and feeder positioning in your garden. When choosing right spot to place this feeder it's always good idea to move it away from the trees in order to avoid squirrel parachute troops from the above. Also, as there are very talented acrobat squirrels who can perform up to 15 feet horizontal jumps, make sure to move this feeder to safe distance away from any tree, roof or wall! Now that we are safe from the "above", the feeder can take care about the squirrels invading from bellow because the squirrels just can't make passed the baffle mounted to the pole. Where to buy Zenith Innovation pole mounted bird feeder? 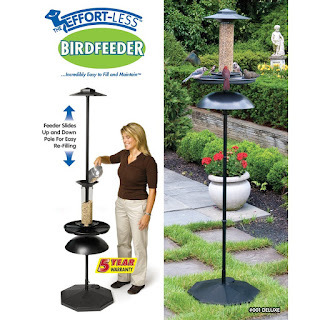 If you really liked this feeder and want to have one in your garden, make sure to check for the best deals and occasional discounts at this link. For detailed reviews from dozens of people who already bought Zenith Innovation, please check here. This has been a wonderful addition to our backyard. We have had it now for over two years. It is sturdy, easy to fill, squirel proof, and has never blown over. I don't usually post comments, however, this product deserves the attention. Looking for another one of these. It is great. Any information where to buy another one? I have Model #002 and am quite pleased with it! However from what I can find, the baffle has been discontinued (why? ), and this is what makes it squirrel proof. Does anyone anywhere still have any of these to sell? A bear destroyed mine last fall. I’ve been looking since, because it’s the best bird feeder I’ve ever had.